This common tree of Alaska and British Columbia south to northern Oregon is represented in California by a few small, isolated groves. In the southern extent of its range, yellow-cedar has a unique ecological amplitude compared to habitats further north. Over most of Alaska and Canada, it is a tree of the coastal mountains, growing from sea level to 3000’. 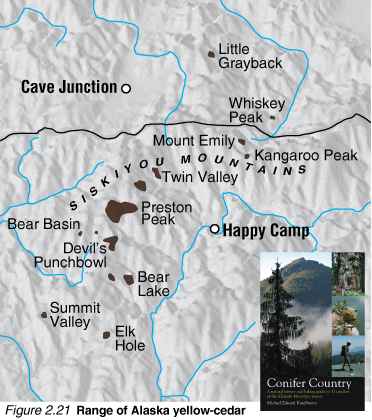 But as the species ranges southward into southern Washington and Oregon it moves upslope into cool, wet, rocky, north-facing glades where subalpine conditions prevail. 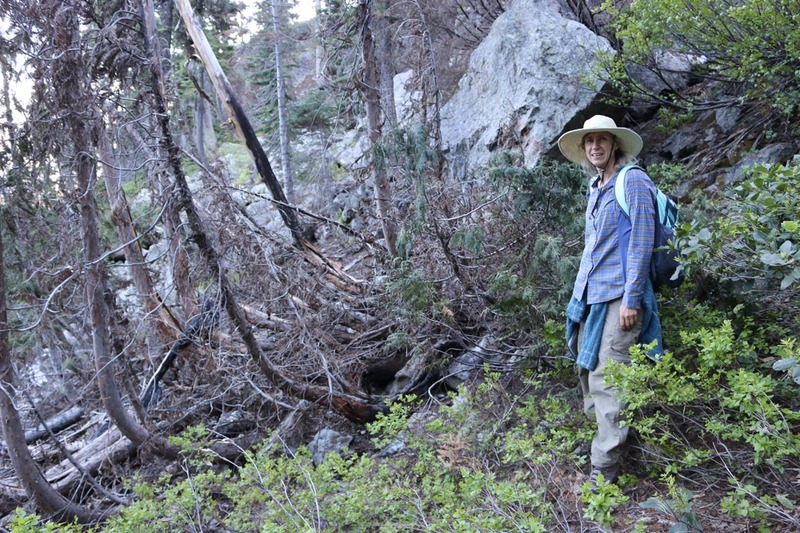 This is also the case in the Siskiyou Mountains, where it is a true relict, surviving in a handful of specific microsites that maintain a cool wet climate. 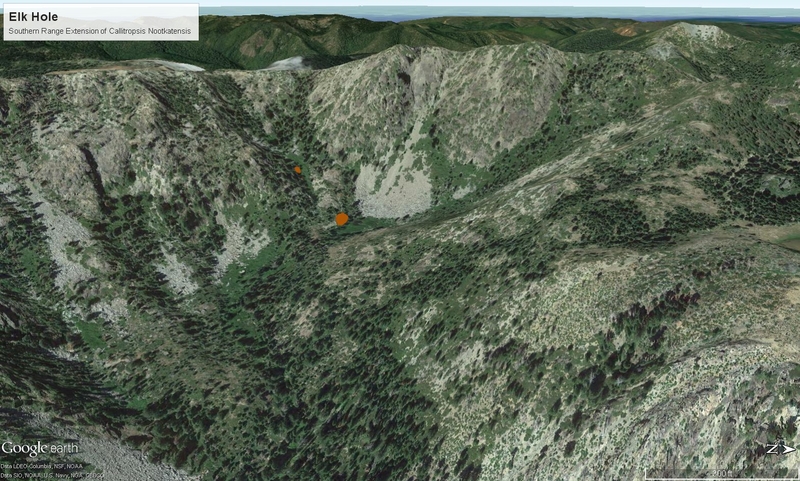 Yellow-cedar trees do not reach significant size in the Siskiyous—rarelymore than ~70’ tall . Although lacking size, all southern stands maintain healthy populations. They often form impenetrable, low-growing thickets along entire rocky washes between subalpine lakes. Elk Hole from the southern ridgeline. Other “cedars” in the region that overlap in habitat with yellow-cedar have a leaf silhouette that can be described as lacy or flattened (Port Orford-cedar) and vertical (incense-cedar). With yellow-cedar the droopy foliage falls from a distinctly conical crown in a definable pattern, creating a wet and tired look. The drooping is an effective adaptation to slough off weighty winter snow without branch breakage. Julie Evens stands in front of a lone yellow-cedar in Elk Hole. Photo by Michael Kauffmann. Where the species overlaps with other cedars, Port Orford-cedar can be distinguished by stomatal bloom in the shape of an X on the underside of the needles while yellow-cedar has no bloom. The spherical cones are similar to those of Port Orford-cedar, but yellow-cedar has fewer than six cone scales, while Port Orford-cedar has more than six. The unopened cone looks like an armored ball because the end of each scale presents a sharply tipped umbo. Most of the year cones remain closed, like cypresses. Though cone production does not occur every year, one may find remnants on the ground from previous years—which will greatly aid with proper identification. The bark is similar to the North American cypresses but thinner. Only the juvenile bark characteristics are important in the region because trees do not get very old (or big) here—gray to brown to rarely black between scaly or shallow ridges. In the Siskiyou Mountains these three “cedars” all occur, sometimes together, making identification challenging. The real challenge lies in finding a location where the regionally uncommon yellow-cedars still survive. 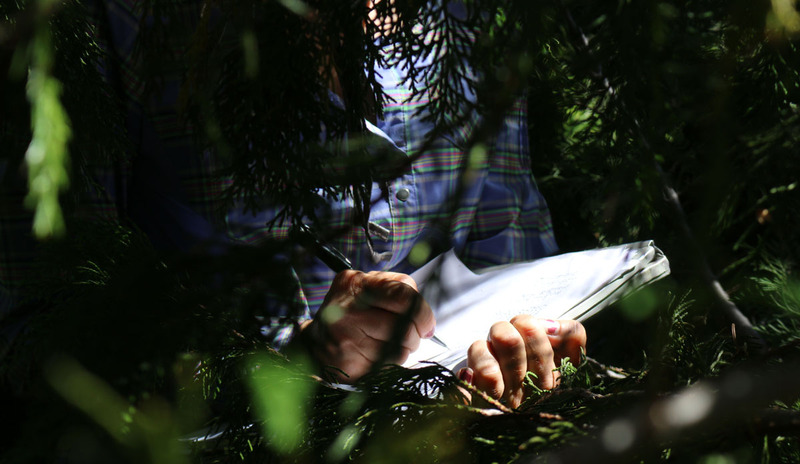 Julie Evens collect belt transect data in a thicket of yellow-cedar. Photo by Michael Kauffmann. This species epitomizes the rarity that makes the Klamath Mountains special. We owe it to the yellow-cedars to make sure they remain healthy in these remote and secret cirques. The results of our work will be published in late 2017–stay tuned. Extent of yellow-cedar at is southern range extension. Map from Google Earth created from data collected in July 2017. Julie Evens standing next to the southern-most trees in the world. This small stand was hit by a fire in 2015. While some trees were killed, many survived. This entry was posted in Plant Exploring, Rare Plants, Vegetation ecology. Bookmark the permalink. I think Torrey Pines may be more rare. Found in La Jolla & Del Mar, and a very small stand in Baja, south of Ensenada. Hi Helen- Globally, Pinus torreyana is the second rarest pine in the world. In terms of number of individuals within the arbitrary political boundary we call California, I would argue there are fewer yellow-cedar than Torrey pine. It is a fun idea to think about!